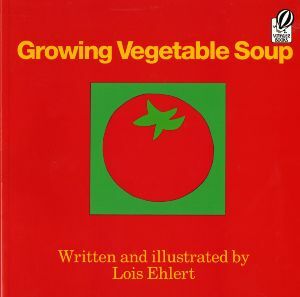 I enjoy Lois Ehlert’s colorful, captivating books and Growing Vegetable Soup is no exception. Featuring her trademark bold, graphic illustrations and a simple message laid out in large print, she tells a story perfect for very small children just learning about gardening and growing. Tools are laid out, seeds are planted and with the turn of each page, we delight in watching a vegetable garden sprout and grow. At harvest, a soup is cooked up (the recipe is included in the back) and declared to be the best ever! I especially like that this is a book in which the father appears to be the gardener and cook (many children’s book still feature the mother as grand poo bah around food and kitchen themes). In my part of the world, we are now in the early growing season and I am looking forward to again sharing the the small bits of gardening we do with our kiddo, who is an enthusiastic garden assistant. It is extremely rewarding to see a child nibble her way through the fruits of her labor! Whether or not you have a large plot or just a few herbs or greens in containers, I hope you can share the same experiences with the youngsters in your life. Growing Vegetable Soup is an inspiration to do so. I recommend this book for ages 2-5.